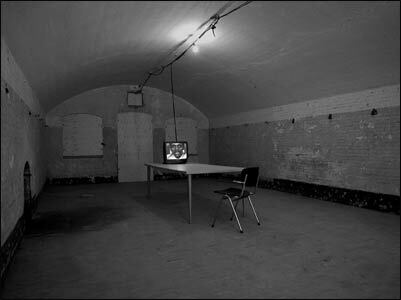 Early in 2000, Peter Bogers was asked to develop a work for a temporary exhibition at ‘Fort Lux’ near IJmuiden in the Netherlands. ‘Fort Lux’ is a large underground fort of concrete corridors and chambers, situated at the mouth of the North Sea Channel, which connects Amsterdam to the world. It was used by Dutch and German military recruits in the First and Second World War. Six monitors are placed on six large tables in six underground chambers. The different rooms are connected by open doorways. Every room has a sort of chimney built in, through which water, formerly used as drinking water for the soldiers, is dripping down day and night. Each monitor shows a different picture of a person talking directly into the camera. The speakers are people from different countries talking different languages. At regular intervals they all stop talking at the same moment, and their face-expressions transform into a state of concentration and quiet meditation. During these quiet moments, the everlasting sound of the dripping water is very present.